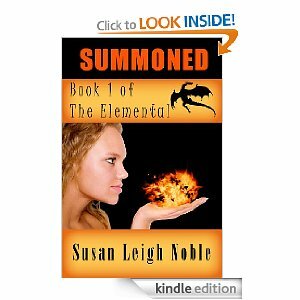 Summoned by Susan Leigh Noble is a fantasy tale about a young woman, Lina, set in a fictional land. At first glance, Lina is a typical young lady, but soon, readers realize that Lina isn’t so typical after all. In fact, she is quite unique. Lina has a STAC cat (whom she can speak to, telepathically), by the name of Tosh, she also possesses powers that the people of her world believed died out, centuries ago. She is an Elemental. An Elemental who has kept her powers secret for years, in fear of how the outside world would perceive it. There’s something else different about Lina. She has an inexplicable desire to head north. While with her father on a business trip, she is kidnapped by gypsies. Her kidnapping results in her fateful meeting with Val, a valiant, nobleman, who saves her. Soon the two, as well as Tosh, run into the thief, Coy, who also joins them on their journey back to her hometown. The only problem however, is that Lina can’t return home, there has been a fire in Zena, which keeps her out, a fire that appears to be much more than a coincidence. That disturbance soon has the group headed north, where they team up with Ty, a warrior and Darnel, a horse trainer. The crew aides Lina as she heads north, but there appears to be a force working against their journey. At every turn, there is a threat facing them from ancient evils that only a Learner could create. Learners, just as with the Elementals, were believed to have gone extinct centuries ago. But the recent events just may prove otherwise. With these challenges, Lina must learn to harness her powers despite her hesitation, and her crew must learn to trust one another if they are to reach their destination. Summoned was an enjoyable read. It wasn’t perfect or nearly perfect, but I enjoyed it. There were quite a few grammatical errors, but I was able to, for the most part, look past those flaws. The characters were fun, I particularly liked Tosh, Coy and of course, Lina. Lina is quite the sympathetic character throughout the novel, which perhaps explains the attraction of others to her. Val was also a nice addition, with his valiant ways. The story flowed well and the addition of dragons managed to peak my intrigue. I’m looking forward to continued adventures in the next book in the series. Kellie is a Mass Communications student and lives in a small Illinois town. She is an avid reader, who enjoys writing, shopping, exercise and a little political spin every now and then.